One of the most challenging aspects of having a child with food allergies are those times when my son is away from me. Playdates, preschool, and time with his grandparents always require a bit of planning. 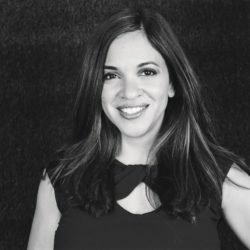 While I’m not perfect, I have learned how to manage his food allergies in a wide variety of situations and can easily identify those foods he isn’t able to eat, particularly those foods that aren’t so obvious. Unfortunately, no matter how much I plan and write information down, there is always a chance that he’ll mistakenly eat a food he isn’t supposed to, although he is very good about telling adults and caregivers what he can’t eat. In one month, I’ll finally get to pack my son’s school lunch and I can’t tell you how relieved I am. His preschool is very good about not giving him the foods he’s allergic to, but very often I feel like he could be eating better…healthier. I simply don’t have any control over his lunches and snacks due to his preschool’s guidelines. A couple of weeks ago, my son picked out a Spider Man Backpack and matching lunchbox. As I was thinking about what I’ll pack for him this Fall, I was reminded of a cool lunch idea I had seen a few months back. The concept of a Bento lunch originates in Japan and consists of a lunch box with a variety of compartments housed with foods like rice, fish or meat, and vegetables. I like the idea for many reasons, primarily because it encourages a healthy, balanced meal with attention to portion sizes. Kids love the concept because it’s fun, colorful, and creative and the finger foods are easy to consume. And because the containers are reusable, there is little waste making it a sustainable lunch solution. 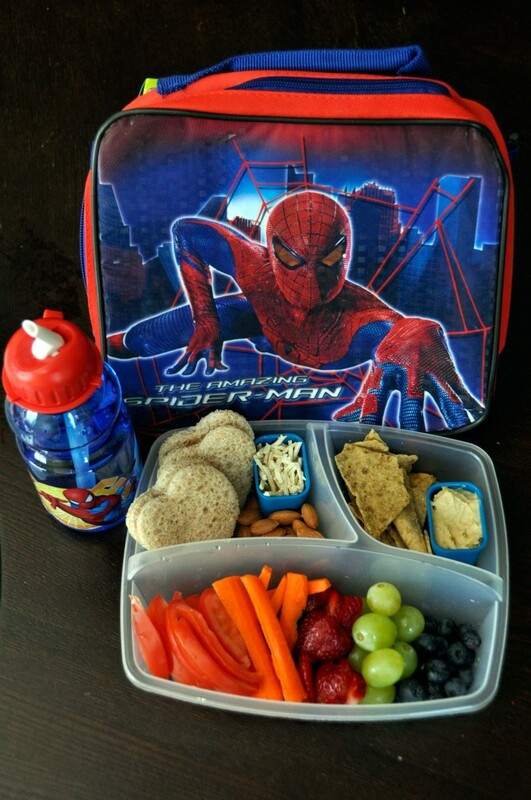 While browsing Walmart’s website, I happened upon a few lunch box solutions that I thought would work with my son’s Spider Man lunch box. 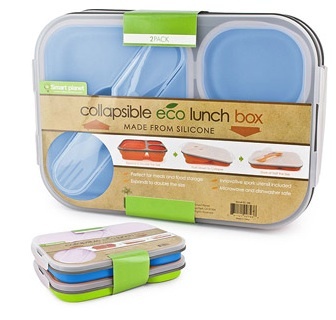 This Smart Planet Collapsible Eco Lunch Box includes 3 compartments and a spork utensil. It’s definitely an eco-friendly solution that would work, but at $25, I thought I’d continue browsing for something a bit more affordable. This Lock & Lock 8-Piece Compact Lunch Box set includes a water bottle, airtight containers with locking lids, chopsticks and a lunch bag, but wasn’t available at my store. At $19.97, I thought it was a bargain for everything that it contains! 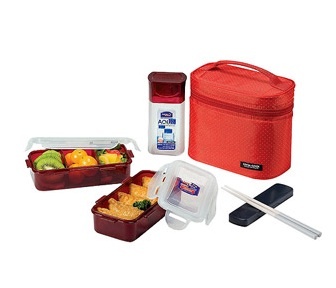 I finally happened upon this Bramli Lunch Kit which includes 2 BPA-free, reusable containers with lids and 2 knife/fork sets. The containers are dishwasher safe and microwaveable and the set retails for just $3.97. 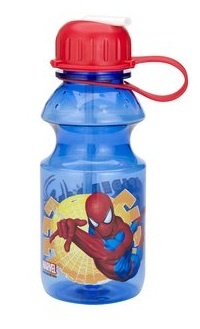 To compliment the set, I picked up a Spider Man-themed BPA-free reusable water bottle from Zak designs. The water bottle includes an attached lid and built-in straw and is dishwasher safe. It retails for $5.92 and the total cost of both items before tax was less than $10 which shows that going green doesn’t have to break the bank! The Bento lunch box I created is not only allergen-friendly (specific to my son, of course) but vegan. Fruits and vegetables should comprise a large portion of a person’s diet so I used the larger space for my son’s favorites. Any fruit or vegetable can be washed and cut up and then paired with hummus, which was my solution. However, if your child is not allergic to dairy, I recommend including Greek yogurt or a home-made dip. The second compartment is where I placed the hummus and rice chips but any variation can be substituted including pita chips, pita bread, or whole grain crackers. In the last compartment, I used a cookie cutter to create heart-shaped almond butter and honey sandwiches. Again, parents can substitute with peanut butter, low fat cream cheese, jam, agave nectar, or even bananas. If you’re looking to ensure the meal is vegan, it should be noted that many breads contain dairy so be sure to read labels carefully. In this compartment I also added some almonds for an additional protein boost. Parents of children with nut allergies can substitute tofu, soy beans, eggs, Wild Alaskan Salmon, or even brown rice with cut up pieces of organic chicken breast (which would of course then no longer be vegan). Have you ever created a Bento Box? 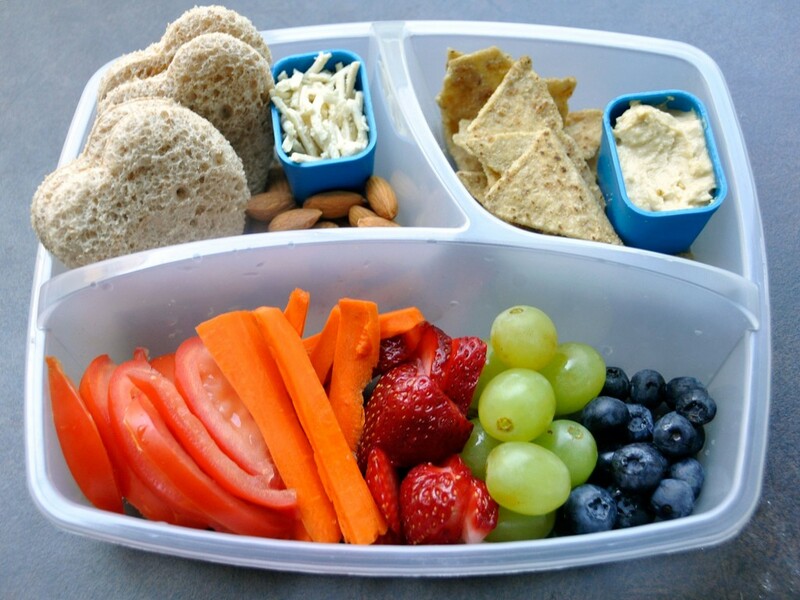 What are your favorite school lunch solutions? Photos: Walmart/Rockin’ Mama. All rights reserved. I LOVE LOVE it! So practical and earth friendly! Glad to see that there are BPA free options now. I use plain tupperware for school lunches, but these cuter varieties probably make young kids very happy! How cool are these systems?! Amazing! Love the dipping trays for the sauces! 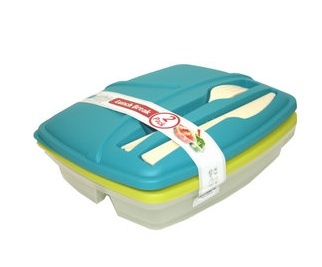 The Smart Planet Collapsible Eco Lunch Box can be found at many Marshall’s, Home Goods, and TJ Maxx stores. Some of them are priced as low as $8-$10. I use one for lunch daily and it works great! I love this! I don’t have to make lunches yet (only have a 2 year old! ), but I love using plastic items that have different sections to keep foods separate. So much easier when it comes to prep and eating. so practical! and allows you to send kids to school with a healthy lunch! These are such a super cute idea Caryn! I love them!! So cute! I was wondering why they were called Bento boxes. I’ve seen them everywhere and they are also one of my favs. My kids aren’t in school yet, but I can’t wait ’til they are ’cause they are so hauling their own lunch to school. Love that the lunch is vegan too! Love it! 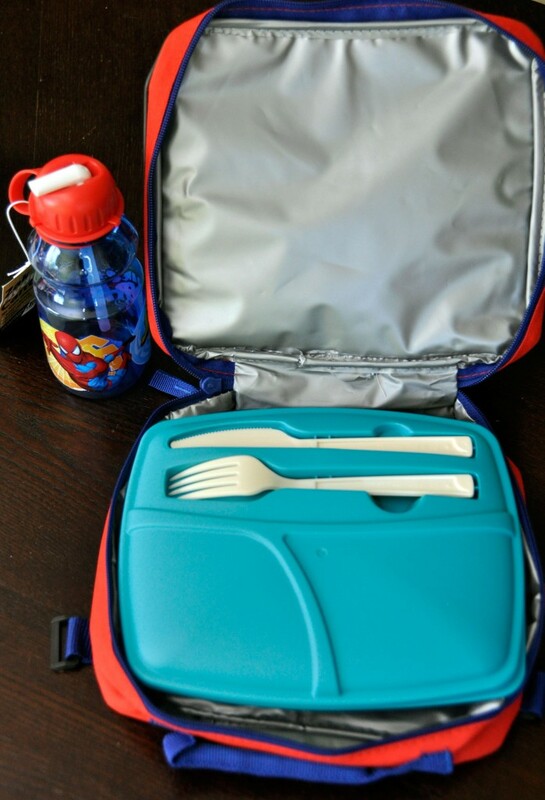 We use Bento Boxes every year for the kids lunches, they are perfect for the type of lunches I pack them! These are great. This is going to be our first year doing Bento Boxes. Can’t wait! We bought those for our lunches last month! I love how cheap they were but had everything I needed AND fit in the lunch box! Love this! I even want one for myself.